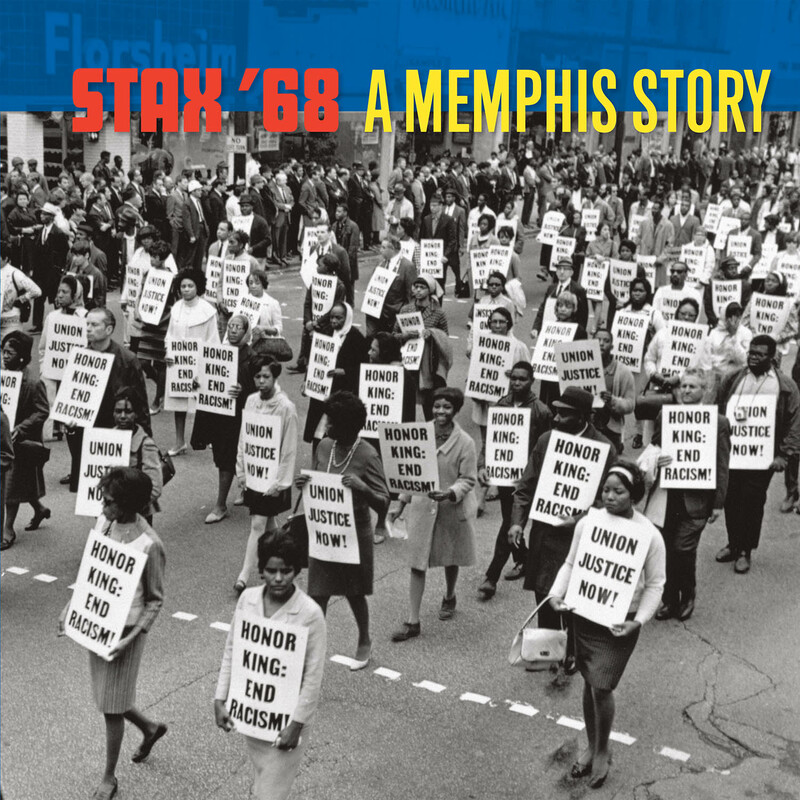 2018 marks the 50th anniversary of a pivotal year for Stax Records and for American history: 1968. 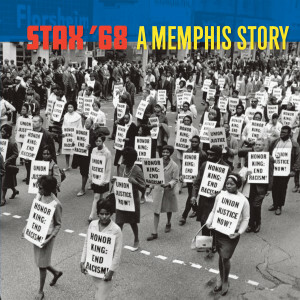 This period immediately follows the untimely passing of Otis Redding; it’s the year that Stax parted ways with Atlantic Records, and it’s also when Martin Luther King was assassinated in Memphis. This 5-disc CD box set compiles every single (A- and B- sides) released on Stax and its subsidiary labels in ’68–over 120 iconic songs from era-defining artists, including Otis Redding, The Staple Singers, William Bell, Booker T. and the M.G.’s, Carla Thomas, Johnnie Taylor, Albert King, Isaac Hayes, Linda Lindell, Rufus Thomas and many more. 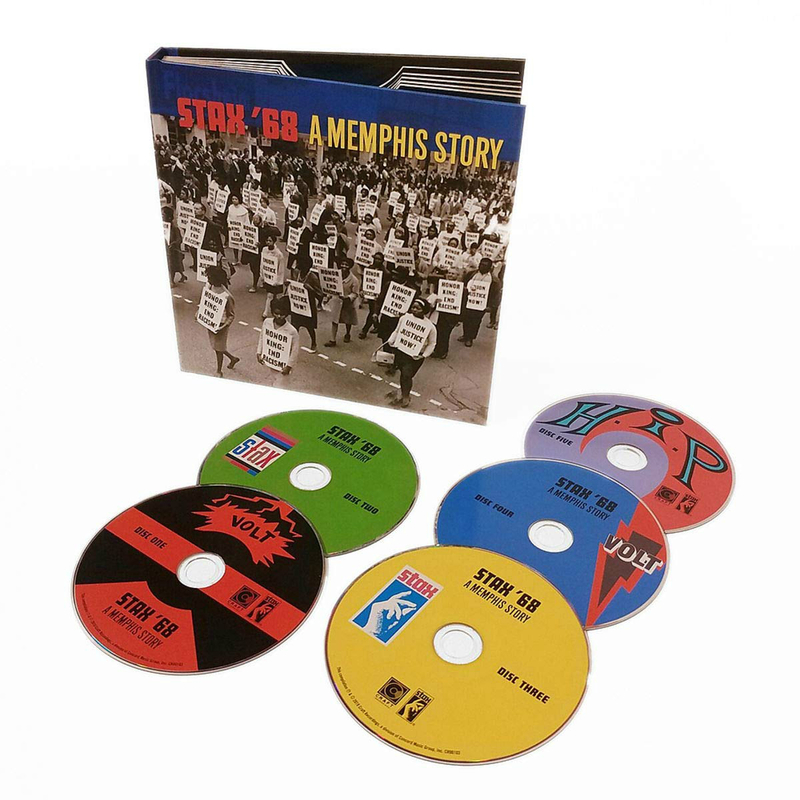 The package features a 56-page book with in-depth liner notes by Andria Lisle, Robert Gordon, and renowned producer Steve Greenberg, plus rare and never-before-seen photographs from the Stax archive. 1 Otis Redding "(Sittin' On) The Dock of the Bay"
2 Otis Redding "Sweet Lorene"
3 Sam & Dave "I Thank You"
4 Sam & Dave "Wrap It Up"
5 The Memphis Nomads	"Don't Pass Your Judgement"
6 The Memphis Nomads	"I Wanna Be (Your Lover & Your Honey)"
8 Shirley Walton "I'm so Glad You're Back"
9 Otis Redding & Carla Thomas "Lovey Dovey"
10 Otis Redding & Carla Thomas "New Year's Resolution"
11 Ollie & the Nightingales "I Got a Sure Thing"
12 Ollie & the Nightingales "Girl, You Have My Heart Singing"
13 Eddie Floyd "Big Bird"
14 Eddie Floyd "Holding on with Both Hands"
15 Bar-Kays "A Hard Day's Night"
16 Bar-Kays "I Want Someone"
17 Johnnie Taylor "Next Time"
19 William Bell "Every Man Oughta Have a Woman"
20 William Bell "Tribute to a King"
21 Mable John "Able Mable"
22 Mable John "Don't Get Caught"
23 Rufus Thomas "The Memphis Train"
24 Rufus Thomas "I Think I Made a Boo Boo"
25 Jeanne & the Darlings "What Will Later on Be Like"
26 Jeanne & the Darlings "Hang Me Now"
1 Derek Martin "Soul Power"
2 Derek Martin "Sly Girl"
3 Linda Lyndell "Bring Your Love Back to Me"
4 Linda Lyndell "Here I Am"
5 Carla Thomas "A Dime a Dozen"
6 Carla Thomas "I Want You Back"
8 Kangaroo's "Every Man Needs a Woman"
9 Isaac Hayes "Precious Precious"
10 Isaac Hayes "Going to Chicago Blues"
11 The Mad Lads "Whatever Hurts You"
12 The Mad Lads "No Time Is Better Than Now"
13 Otis Redding "The Happy Song (Dum-Dum)"
14 Otis Redding "Open the Door"
15 Albert King "(I Love) Lucy"
16 Albert King "You're Gonna Need Me"
17 Johnnie Taylor "I Ain't Particular"
18 Johnnie Taylor "Where There's Smoke There's Fire"
19 Eddie Henderson Quintet "Georgy Girl"
20 Eddie Henderson Quintet "A Million or More Times"
21 Shirley Walton "Send Peace and Harmony Home"
22 Shirley Walton "The One You Can't Have All by Yourself"
1 Booker T. & The MG's "Soul Limbo"
2 Booker T. & The MG's "Heads or Tails"
3 Eddie Floyd "I Never Found a Girl (To Love Me Like You Do) "
4 Eddie Floyd "I'm Just the Kind of Fool"
5 Delaney & Bonnie "It’s Been a Long Time Coming"
6 Delaney & Bonnie "We Just Been Feeling Bad"
7 Linda Lyndell "What a Man"
8 Linda Lyndell "I Don’t Know"
9 Harvey Scales & The Seven Sounds "Broadway Freeze"
10 Harvey Scales & The Seven Sounds "I Can't Cry No More"
11 Johnny Daye "Stay Baby Stay"
12 Johnny Daye "I Love Love"
13 Bobby Whitlock "Raspberry Rug"
14 Bobby Whitlock "And I Love You"
15 Judy Clay and William Bell "Private Number"
16 Judy Clay and William Bell "Love-Eye-Tis"
17 Jimmy Hughes "I Like Everything About You"
18 Jimmy Hughes "What Side of the Door"
19 The Delrays "Lollipop Lady"
20 The Delrays " (There's) Always Something There to Remind Me"
22 Lindell Hill "Used to Be Love"
23 The Aardvarks "Subconscious Train Of Thought"
24 The Aardvarks "Unicorn Man"
25 Fresh Air "Somebody Stole My Gal"
27 Judy Clay "Bed of Roses"
29 The Staple Singers "Long Walk to D.C."
1 Staple Singers "Stay With Us"
2 The Soul Children "Give 'Em Love"
3 The Soul Children "Move Over"
4 Johnnie Taylor	"Who's Making Love"
5 Johnnie Taylor "I'm Trying"
6 Rufus Thomas "Funky Mississippi"
7 Rufus Thomas "So Hard to Get Along With"
8 Carla Thomas "Where Do I Go"
9 Carla Thomas "I've Fallen in Love "
10 The Mad Lads "So Nice"
11 The Mad Lads "Make Room"
14 Jeanne & the Darlings "It's Unbelievable (How You Control My Soul)"
15 Jeanne & the Darlings "I Like What You're Doing to Me"
16 Southwest F. O. B. "Smell of Incense"
17 Southwest F. O. B. "Green Skies"
18 The Village Sound "Sally's Got a Good Thing"
19 The Village Sound "The La La Song"
20 Eddie Floyd "Bring It on Home to Me"
21 Eddie Floyd "Sweet Things You Do"
22 Booker T. & The MG's "Hang 'Em High"
23 Booker T. & The MG's "Over Easy"
24 Ollie & the Nightingales "You're Leaving Me"
25 Ollie & the Nightingales "Showered with Love"
26 The Pop Corn Generation "Kitchy Kitchy Koo"
27 The Pop Corn Generation "Shake It"
29 Bar-Kays "In the Hole"
1 Dino & Doc "Mighty Cold Winter"
2 Dino & Doc "A Woman Can't Do (What a Man Do)"
3 William Bell "I Forgot to Be Your Lover"
4 William Bell "Bring the Curtain Down"
5 The Goodees "Condition Red"
6 The Goodees "Didn't Know Love Was so Good"
7 Mable John "Running Out"
8 Mable John "Shouldn't I Love Him"
9 Billy Lee Riley "Family Portrait"
10 Billy Lee Riley "Going Back to Memphis"
11 Judy Clay and William Bell "My Baby Specializes"
12 Judy Clay and William Bell "Left Over Love"
13 The Soul Children "I'll Understand"
14 The Soul Children "Doing Our Thang"
15 The Staple Singers "The Ghetto"
16 The Staple Singers "Got to Be Some Changes Made"
17 Albert King "Blues Power"
18 Albert King "Night Stomp"
19 The Epsilons "The Echo"
20 The Epsilons "Really Rockin"
21 Rufus Thomas "Funky Way"
22 Rufus Thomas "I Want to Hold You"
23 The Generation "The Children Have Your Tongue"
24 The Generation "Give Her What She Wants"
25 Daaron Lee "Who's Making Love"
26 Daaron Lee "Long Black Train"
27 Johnnie Taylor "Take Care of Your Homework"
28 Johnnie Taylor "Hold on This Time"